The oft-quoted statistic is that motorcycle-vehicle crashes are twenty-nine times more deadly than vehicle-vehicle crashes. The reason is simple. Vehicle occupants usually have several restraint layers for protection, not to mention a plastic, steel, and glass cocoon. Motorcycle riders almost literally only have the clothes on their backs. But, items like these only tell part of the story. Florida motorcycle riders almost always suffer catastrophic injuries in these crashes. If they survive, their medical bills and physical therapy expenses are usually astronomical. Where can victims turn in situations like these? In many ways, there is no such thing as a “minor motorcycle accident.” Even if the victim is not seriously injured in the traditional sense, the victim often sustains serious road burns. These large abrasions are much more than just annoying. Essentially, the road scrapes away part of the skin when the rider lands hard following a crash. These burns are incredibly painful and almost impossible to treat. Rest is the only cure and also the only treatment. While they heal, the victim’s mobility may be reduced to almost nothing. Bills pile up because the victim cannot work, and loved ones feel ignored because the victim can hardly get out of bed. In Florida, compensation is usually available for both economic losses, such as the aforementioned medical bills, and noneconomic losses, including loss of consortium (companionship). 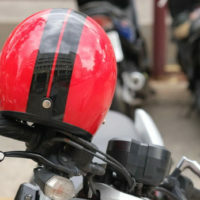 Florida law requires riders over 21 to either wear helmets or carry an additional $10,000 in medical benefits coverage. But this law does not say that failure to wear a helmet cuts off the right to recovery. So, even if the victim had neither a crash helmet nor the additional insurance, a negligence action is still possible. At best, failure to wear a helmet is like failing to wear a seat belt. In Ridley v. Safety Kleen Corporation, the Florida Supreme Court departed from the majority of states and declared that failure to wear a seat belt was contributory negligence in Florida. To win such an argument in motorcycle crash cases, insurance company lawyers must do more than talk about generic safety statistics. Instead, they must establish what portion of the victim’s injuries were related to head trauma and what portion of these injuries a helmet could have eliminated. Obviously, such evidence is not much more than speculation. This kind of testimony is inadmissible in many cases. Florida is a pure comparative fault state. The judge reduces damages based solely on the victim’s percentage of fault. If a jury concludes that a helmet would have reduced damages by 20 percent, the victim is still entitled to 80 percent of the award. Many people in Florida believe that motorcycle riders are reckless thugs. Jurors with these feelings might be inclined to reduce the victim’s damage award or embrace a contributory negligence defense. Both these things spell trouble for victims. An attorney must be very careful when confronting the motorcycle prejudice. No one likes to be called a bigot, even if s/he knows the shoe fits. So, it’s usually best to separate the victim from the prejudice. Evidence on this point includes facts about the victim’s caution as a rider. Put another way, it’s almost impossible for a lawyer to change someone’s mind. But it is possible to convince these people that this particular victim is an exception to the rule. Motorcycle crash cases have a number of subtle twists. For a free consultation with an experienced personal injury lawyer in Brandon, contact Reed & Reed. We have four area offices (St. Petersburg, Lakeland, Tampa, and Clearwater).